Reports of a mass British exodus from the Dordogne-or Périgord, as this ancient region of south-west France is otherwise known-have been greatly exaggerated, say leading international estate agents. Following a brief hiatus at the start of the recession in 2009, when the number of Britons buying homes in the area slowed dramatically, discerning UK buyers are rekindling their passion for Périgord, which still has the highest concentration of long-term British residents of anywhere in France, outside Paris. The appeal of this voluptuous region-with its rolling hills and wooded slopes, rich architectural heritage and endless gastronomic delights-lies in its unchanging quality of life and landscape that, for many, recalls ‘Britain as it used to be’. Once home to warlike Gaulish tribes who resisted the Roman occupation, Périgord is divided into four sectors within the Dordogne, one of the 83 original départements created during the French Revolution. with the administrative centre of Sarlat at its heart. A criticism often levelled at British owners who buy and restore historic French houses is a tendency to go ‘over the top’ in terms of renovation and refurbishment. That definitely doesn’t apply to the delightful Château La Tuque near Eynesse, on the banks of the Dordogne in Périgord Noir, which is being sold on behalf of British owners returning to the UK. Originally two buildings now fully integrated as one, La Tuque was the family home of the radical French writer Elisée Reclus, and his brother Armand, a naval lieutenant who worked here on designs for the Panama Canal in the late 1870s. Today, La Tuque stands in 24 acres of countryside forever linked to the Hundred Years’ War, surrounded by the hundreds of château-vineyards of this famous growing region. Knight Frank (020-7629 8171) and their Périgord asso-ciate Classic French Homes in Eymet (00 33 5 53 23 32 13) quote a realistic guide price of €2.55 million for the beautifully refurbished, 18th-century château and its 19th-century manor house, which together provide three fine reception rooms, a kitchen/breakfast room, nine bedrooms and six bathrooms; a partially reno-vated caretaker’s cottage offers two reception rooms and three further bedrooms. The grounds include a swimming pool, formal gardens, paddocks, pasture and woodland. The Dordogne has more than 1,000 fortified châteaux, among them the 14th-, 16th- and17th-century Château d’Auberoche, near Sarlat, a registered Monument Historique. Stewart Cook of Classic French Homes waxes lyrical about this ancient fortress made up of two round towers and a main house with wings, the whole forming a square with a central entrance gate. Set in a private, 336-acre, wooded estate in the heart of Périgord Noir, every stone of this remarkable complex, with its semi-ruined towers, turrets and battlements and sensitively restored domestic space, exudes a sense of living history. Auberoche is splendidly authentic, from its original stone floors and staircases to the huge fireplaces, stone vaulted ceilings, studded oak doors and courtyard where roses clamber over ancient doors set in weathered stone. Mr Cook quotes a guide price of €4.25m for this ‘hidden gem’ of an estate on behalf of its French owners, whose parents bought it in 1970 and spent the next 20 years restoring the château and its adjoining buildings. Accommodation includes four reception rooms, two studies, six bedrooms, three bathrooms, attics and a one-bedroom caretaker’s flat. The same agents quote a guide price of €3.71m for a classic 18th-century chartreuse, or farmhouse-style country house, near Le Bugue, also in Périgord Noir. But there’s nothing bucolic about the origins of Forge-Neuve, as it was built in the early 1700s for the owners of a massive iron foundry whose flames projected a ‘sinister night-time glow’ over the surrounding countryside, according to French writer Charles Marionneau, who visited the area in 1844.
which comes with a restaurant licence, also has a separate four-bedroom house with an adjoining three-bedroom cottage, and four one-bedroom guest cottages. As the scion of one of Périgord’s most illustrious families, Bruno de Saint-Exupéry of Emile Garcin Périgord at Bezenac (00 33 6 63 49 82 46) is well versed in the history and heritage of his native area. 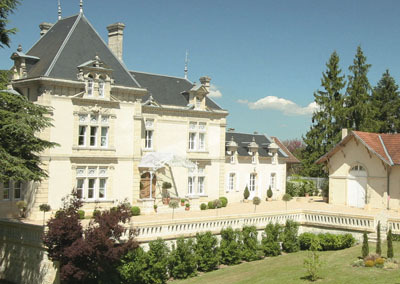 He is handling the sale of two splendid 19th-century houses, Château La Berthonie, near Bergerac, in Périgord Pourpre, and Château Bonnet at Brantome, near Périgueux, both sensibly priced at €2m and €1.55m respectively. Château La Berthonie, with its walled outer courtyard bounded by traditional 16th- to 18th-century outbuildings, has enormous old-world charm. The château itself is a whimsical blend of Loire valley architecture, with four corner towers of differing shapes and sizes, and spectacular views over 58 acres of gently sloping parkland and forest. The interior has been painstakingly restored by its British owners, and includes an impressive entrance hall and staircase, an elegant salon and formal dining room, five/six large bedrooms and five bathrooms. The grounds include a fine Périgordine dovecote, various barns, and a large, heated pool sheltered by hedges and rose gardens. Built within a walled outer courtyard in the early 1800s for the aristocratic Lamberterie family, the Château Bonnet is similar to La Berthonie in style and layout. The equally elegant interior, which has been restored with great care by its French owners, includes four reception rooms, eight bedrooms, four bathrooms and a large, wood-framed attic. Its 24 acres of meadow and forest include a dovecote, a substantial barn and a heated swimming pool.